Rather than attending a lecture or sitting in a really boring classroom as the teacher drones on and on about generals and dates of battles…try a reenactment. 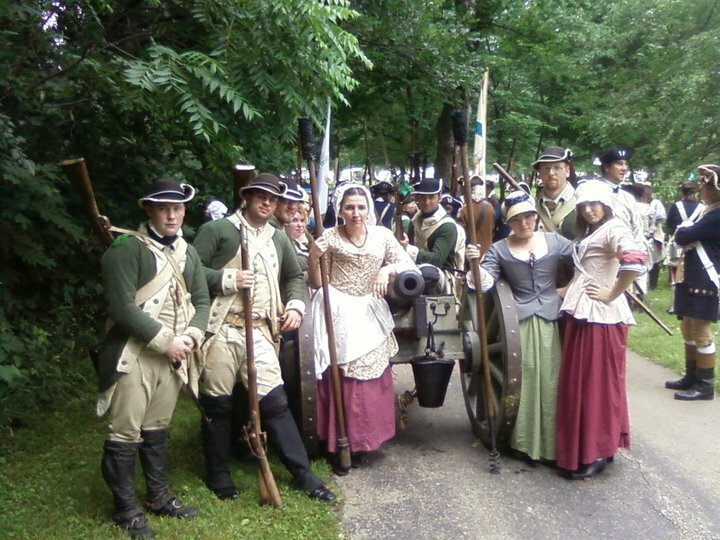 Visiting a Revolutionary War Reenactment may give you or your kids a whole new perspective. You may even enjoy yourself. Gasp! If you live anywhere near Chicago or central Illinois, jump on route 57 and head towards Kankakee this weekend. It’s only 60 miles south of Chicago, and about 60 miles north of Champaign. We’ll be there Saturday, June 8th and Sunday, June 9th in the morning and afternoon. Klash on the Kankakee (that’s the event’s official name) will be held at Governor Small Memorial Park. Use the map below (you can click on it to make it bigger) or plug this address into your GPS or Google Maps: 801 South 8th Avenue, Kankakee, IL 60901. You might think this is a country thing. I guess that’s the stereotype. Plus my website is all about moving to the country from the big city, so I’m probably not helping that. But I was reenacting long before I met Thomas. In fact, most of our unit members live in Chicagoland. And as an organization, the NWTA has members from all over the Midwest. Interested in reenacting yourself? We’re always looking for new recruits! Send me a message on my facebook page at http://www.facebook.com/sweetpeasandsoybeans. You can try out a couple of reenactments and see what you think. Or visit NWTA.com for more information about our organization. Our Unit: The Continental Marines. And yes, that’s our cannon. I would like to be a drummer boy but do I need a authentic wooden drum. Good question. You’d certainly want to use an authentic drum, but that doesn’t mean you’d have to run out and purchase one right away. There are a number of units that have a spare. which you could borrow for a time. Beginning reenactors do a lot of borrowing when they first start out. Are you in the midwest area at all? I could put you in contact with our music coordinator. She’s amazing, and super encouraging for newcomers. Yes I am located in the Midwest and my email is machoman44441@gmail.com if you want to contact me. Also I am already in contact with a regiment I want to join,third new York and they sent me to nwta. But I am still looking so if yours does not require a spicific uniform I will go with whatever needs a drummer more. That’s great, I would love to join the regiment. My parents are willing to support and go anywhere necessary, I am eleven. I have had processional drum lessons for 4 years. Tell your music cordnatior to contact me. Thats all for now. *professional drum lessons, stupid auto correct. Sounds great Liam. I’m with the Continental Marines and we do have a specific uniform. Most of the units do, but not all. I’ll give your email address to our music coordinator. Her name is Allison, and I’m sure she’ll contact you soon. She’s a good friend of mine. She’s not in my unit…she organizes the music for the whole NWTA. So trust me when I say I’m getting you in contact with the right person. 🙂 Hopefully we’ll see you out there this season! And feel free to ask me any other questions you have. how would i get the uniform for the unit. Typically, if someone is interested in reenacting, they borrow a uniform and try out a couple of events. After that, each unit kind of does things a little differently, but the general way things go is that the person begins to put together their uniform “kit” piece by piece, until eventually they own all their own equipment. Liam, since you’re interested in being a drummer and you’re already in contact with the 3rd New York regiment, I’d suggest starting there. I’m not sure how they do things, but I’m guessing they’ll let you borrow a uniform so that you can try things out. As far as the Continental Marines, we don’t march very often, since we’re usually hauling around our canon. So you’d be very limited as far as the drumming is concerned, and I want you to have fun out there doing what you want to do. It may be, for a civilian. A lot depends on how the seamstress got her pattern (she could just be using a standard costume pattern, which is a simplified version) and I don’t know what material she used. Regardless, I don’t think you should buy it, and I’ll tell you why: each regimental unit has similar but different “small clothes,” which is what you’re looking at here (the pants, shirt, and vest). It’s part of the uniform. So you don’t want to go spending your time or money on the wrong thing. I admire that you’re trying to get prepared ahead of time– don’t lose that enthusiasm! Whichever unit you pick will love that. But pick a unit first, and make sure reenacting is for you. Then, you’ll get that unit’s GIR, which is a documented list of the things the soldiers in that unit would have worn. They’ll help you put together your outfit from there.